I just wanted to sit down for a moment, look back on 2013, and share a few thoughts that have been on my mind. This past year has been a great one for Run for God. Thanks to your support and God’s AWESOME grace, we have continued to see tremendous growth. As of today, Run for God has been taught in 49 of the 50 states (come on Connecticut), and 6 countries. Nearly 1300 different churches, schools, and athletic clubs have walked through the Run for God Challenges with over 27,000 graduates. This past year we’ve added some new programs, new products, new races, and even had the privilege of hiring some new faces. Are things always perfect here at the Run for God shop? Not even close! Yes God is a perfect God, but I’m still Mitchell and I can certainly mess things up from time to time. Some of you may remember the books with upside down pages, incorrect pages, or recently missing pages. Yes, I occasionally make grammar mistakes, printing mistakes, and I’ve even been known to stick my foot in my mouth. It’s a good thing God call’s workers, not perfect workers, or well-spoken workers, but workers. So why do I keep such a close eye on these numbers? Because it’s a very clear reminder that God is using this program to touch the lives of people all over the world. If you’ve read the introduction of The 5K Challenge, you know that I was happy with 12 T-shirts, I was happy and content with teaching one class at my church, I was ready to go back to my “Building” career after our first graduation race. 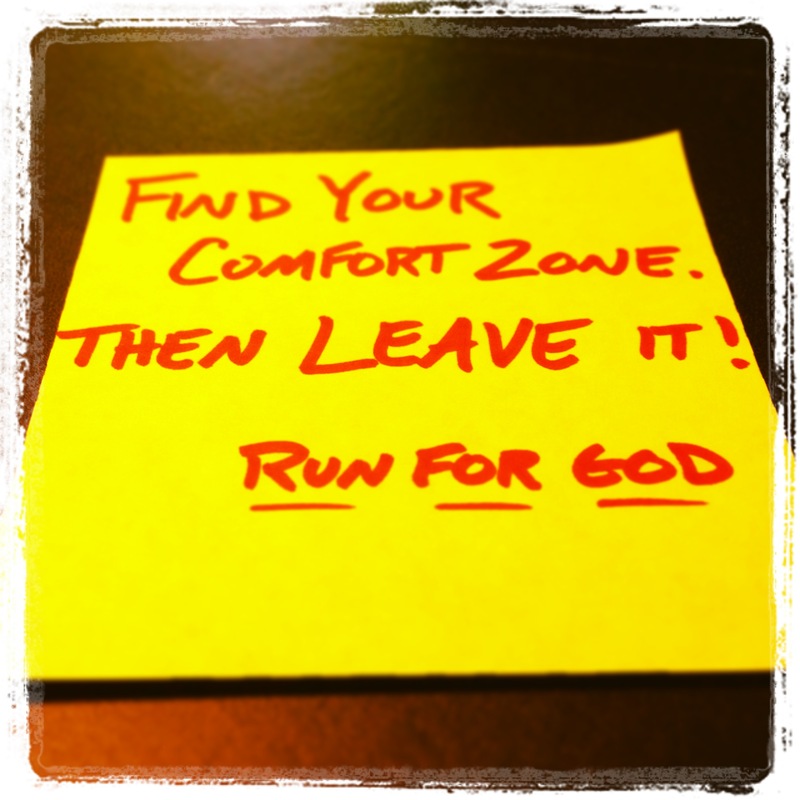 Run for God is not something I went looking for, but it was something that the Lord laid on my heart and a decision had to be made, go or don’t go. Early on, I said this would never work. I felt unworthy; I mean who was I to lead a program like this? I wasn’t an author, I’d never been to seminary, I wasn’t an Olympic Marathoner, I’m not even that good of a runner, although I do love it. I had a million excuses as to why I couldn’t do this and none of them seem to slow God down. Then one day it hit me! I AM unworthy and unprepared, but maybe that’s exactly where God wants me. At our moments of weakness, God WILL show His strength. So why am I bringing all this up? Because it seems that over the past year I have talked to so many people who relate to my story. They feel the Lord pushing them to do something, something outside their comfort zone, but something just seems to be holding them back. One gentleman told me this past year that he has felt the Lord calling him to start a Christian based workout gym, another lady shared with me her idea of a Christian Children’s book. There were several others that shared great ideas with me, and more importantly they indicated they felt the Lord calling them to these ideas. So why haven’t they acted? Fear! Fear is one of the devil’s best tools. The ideas that I’m not good enough, that I’m not worthy, that it just won’t work, are all fear tactic’s. Here is the bottom line. If you truly feel the Lord calling you to do something, you’ve prayed about it, and aggressively sought His direction, and you know that you know, THEN DO IT! It doesn’t matter how prepared you are, how good you are, or what your titles are, if God birthed the idea, go for it. We will NEVER be good enough to do anything God sized, but God is, and that’s all that matters!